Muringayila Chakkakuru Mulakushyam | Drumstick leaves and jackfruit seeds curry recipe with step by step photos and video recipe. 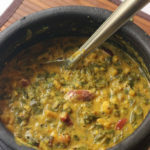 simple, healthy and comforting curry recipe for rice with drumstick leaves / murungai keerai and jackfruit seeds/ palakottai cooked with dal and coconut paste. Cook the tur dal, mash and keep it ready. Cook the jackfruit seeds for a whistle and keep it ready. Also, Grind everything given under “to grind raw” to a fine paste. 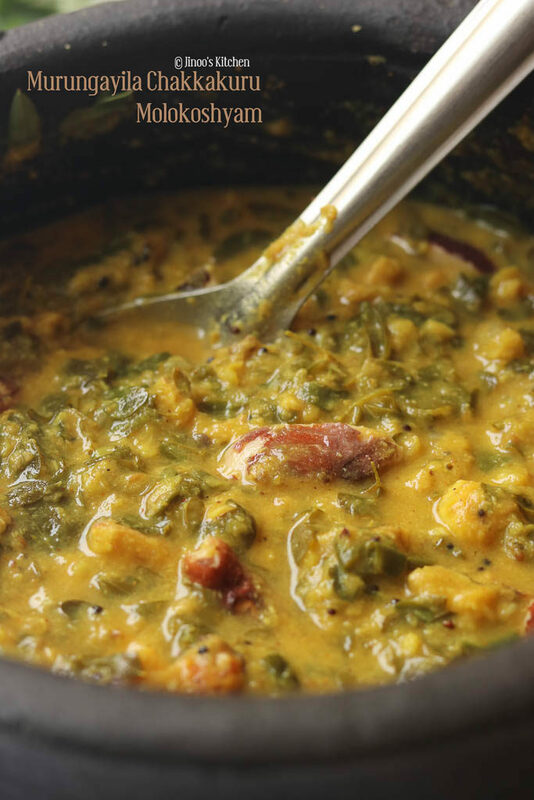 Take the cooked dal, prepared masala, tomatoes, turmeric powder, cooked jackfruit seeds, water, and salt required. Pour enough water, mix well and cook the mix. let it boil for at least 5 minutes. Meanwhile, wash and squeeze out the drumstick leaves into the curry and mix well. Cook in medium heat for just 5 minutes. For tempering: Heat coconut oil and crackle mustard seeds, coriander seeds, curry leaves, red chilli, small onion, and grated coconut. Fry the mix along with a pinch of asafoetida until the coconut turns brown and crisp. Pour the tempering over the curry and mix once. Close and let it sit for 5-10 minutes before serving. 1.Pressure cook the jackfruit seeds with just enough water for a whistle. 1-2 whistle is sufficient. Else it may get mashed. 2. For the coconut masala – Grind the following items raw. Small onions, coconut, cumin and sambar powder. Grind to a fine paste. 3. Cook and mash the tur dal separately before starting to cook. 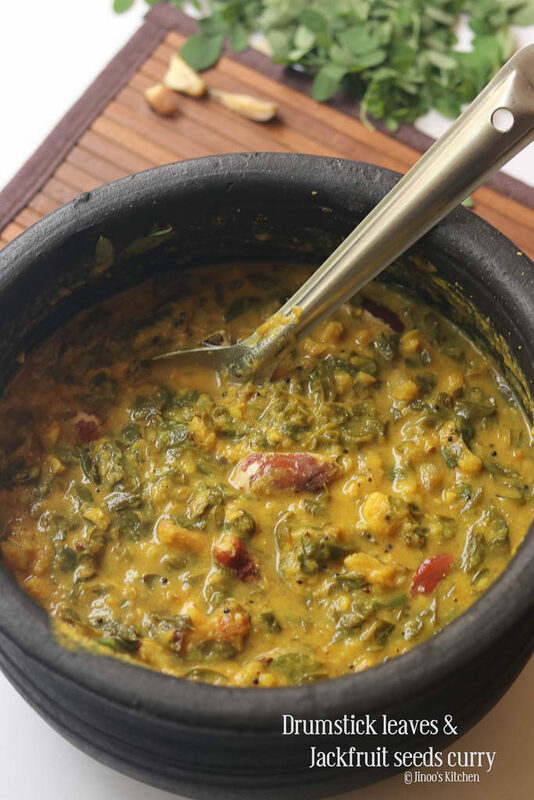 Take the cooked dal, prepared coconut masala in a mud pot preferably. 4. Together add roughly chopped tomatoes and turmeric powder. 5. Furthermore, add the cooked jackfruit seeds along with the water to adjust it to a thin consistency. 6. Finally, add salt to taste and mix well. Let it come to a rolling boil and boil for at least 5 minutes to come over the raw smell of masala. 7. Wash and keep the drumstick leaves ready. squeeze out the water and add the drumstick leaves and mix well. After adding drumstick leaves, need not cook for more than 5 minutes. It cooks faster. Also, do not close and cook any greens. Leave it open. 8. For the tempering: Heat coconut oil and crackle mustard seeds, coriander seeds, curry leaves, red chilies and sliced small onions. Add the grated coconut along with it. 9. In between, pinch in the asafoetida and fry until coconut turns crisp and brown. 10. Add the tempering to the curry and mix well. serve after resting it closed for 5-10 minutes.